A key pair is used by AWS to authenticate you when you will connect to the EC2 virtual machine. The key pair consists of two keys: the public key and the private key. The private key should be stored in a secret place, and you should not give it to anyone. 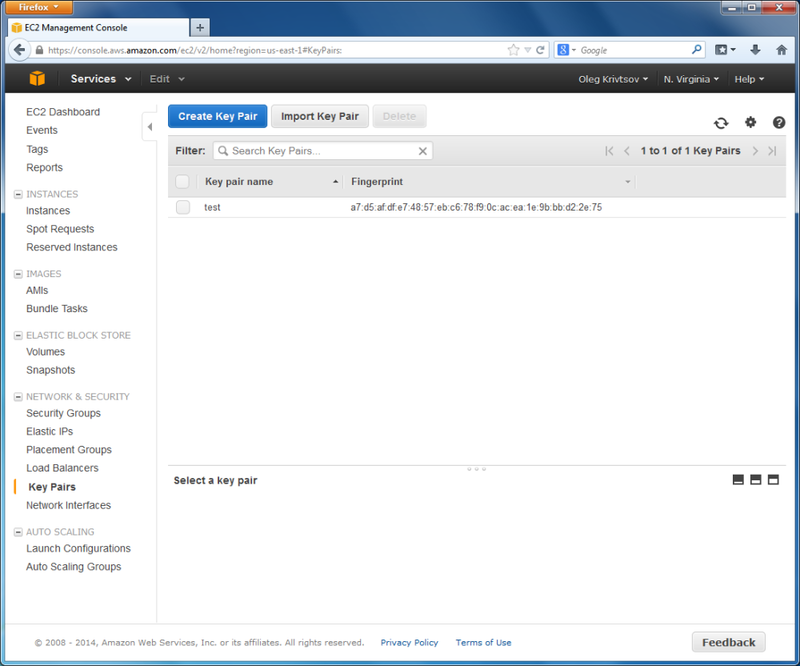 Click EC2 icon in your AWS Management Console window. EC2 Console page appears. The page has a side bar menu where you can find several sections like INSTANCES, IMAGES, ELASTIC BLOCK STORE, NETWORK & SECURITY. In order to securely connect to your virtual server through SSH protocol, you need to create a key pair. To do this, in the EC2 Console side bar menu, under NETWORK & SECURITY section, click the Key Pairs link. On the page that appears, click the Create Key Pair button and enter the name for your new key pair (for example, enter ‘test’) and press the Create button. When your key pair has been generated, you are offered to download the key as a PEM file. Save the file to some folder – you will need it later.